Roomba i7 vs 980 vs 960 comparison What's the best Roomba in 2019? Only a few years ago, robotic vacuums were a novelty. Today, they are a part of the daily lives of thousands of people. In fact, dozens of manufacturers have introduced their own robotic vacuum products. Still, there is one name that comes to the mind of most people when they think about these devices: Roomba. 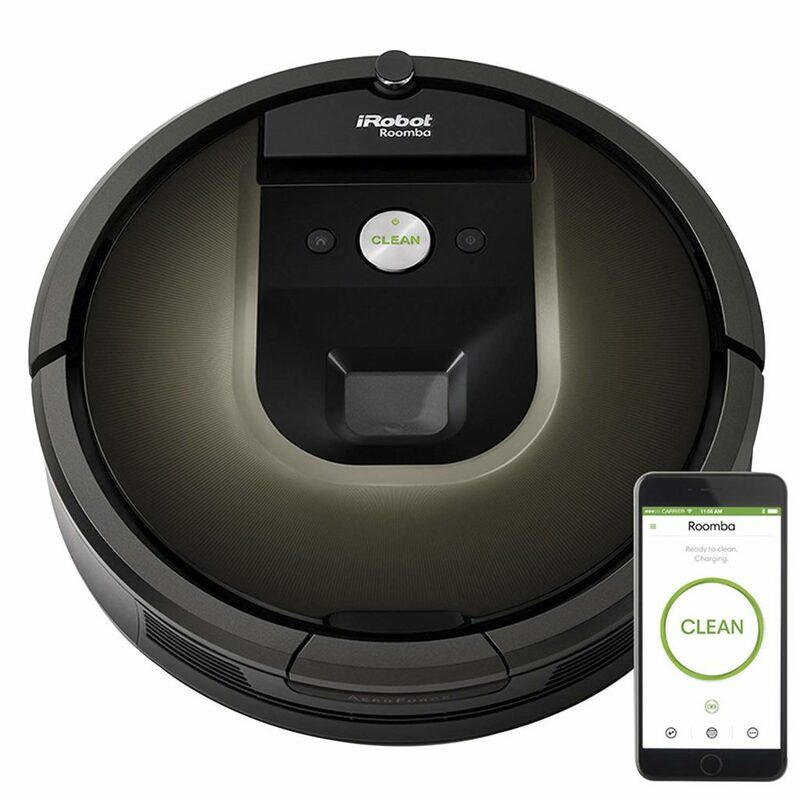 Produced by iRobot, the Roomba series is recognized all around the world for including some of the most iconic and advanced robotic vacuums on the market. At this point, there are too many models of the robotic vacuum to be listed. However, there are certain models that stand out among the rest. Today, we will talk about three of the most notable Roomba models available: The Roomba i7, the Roomba 980 and the Roomba 960. Apart from discussing their pros and cons at length, we will make important distinctions between them that will help you get a clear idea of what they have to offer. Keep reading this Roomba i7 vs Roomba 980 vs Roomba 960 comparison to get in-depth information about these three models. By putting them against each other, hopefully, we can help you choose the robotic vacuum model for your particular needs. Featuring a clean and slick design with simple controls, the i7 is a truly user-friendly device. It’s smaller and lighter than both the 980 and the 960 iterations of the robotic vacuum. That fact, however, does not affect its performance in comparison to the other two models. This robotic vacuum’s streamlined design makes the setup process easy and convenient. Once it is all set up, you only need to press the big button labeled “clean” to get the device to start working. Before cleaning a particular space for the first time, the i7 creates a map of it to help navigation. Due to its cleaning technology, this device works almost flawlessly on hard floors of various different materials. What’s more, the device works just as well on both low-pile and high-pile carpets. Even better than that, it’s capable of picking up various types of debris with equal effectivity. Without a doubt, one of the most useful features this and other robotic vacuums have is smartphone compatibility. Through the use of a sleek app, you can give a series of instructions to your Roomba i7. This includes starting or stopping the cleaning process, creating schedules and more. To recharge and empty itself, this robotic vacuum connects to a dock. It does this automatically whenever its system concludes that it’s necessary. To collect dust and debris, it uses the same collection bin as the 980 and the 960. Ample, it allows two or even three cycles before it needs emptying. The i7 does not use a traditional brush to pick up debris. While extractor bars tend to work well, they present a few problems, the most important being that this system is prone to clogging when exposed to certain types of debris. Animal hair is particularly problematic in this regard. Just like the 980 and the 960, the i7 uses brushless extractor bars to collect debris. This extractor uses a three-step system to collect dust, dirt and other pieces of waste without making use of rotating brushes. This eliminates most clogging issues without sacrificing functionality. Expanding on the device’s three-step cleaning system, it can be said that it combines various mechanisms to clean deeply and effectively. First, it uses multi-surface tools to clean any dirt. Then, it uses edge-sweeping flat brushes to pick up any leftover debris. Finally, the vacuum uses powerful suction to leave the floor spotless. To prevent overheating and other problems, the i7 uses high-efficiency filters. This is important as a dirty filter can cause many problems, including the reduction of battery life. Take into account that you will still have to change these filters with regularity, though. When looking at the i7’s battery, we begin to see its advantages over the other two products featured in this article. The 3300mAh lithium-ion device has an impressive maximum runtime of 120 minutes. You should note, though, that this runtime is reduced when this robotic vacuum model is used on carpets. As previously mentioned, the i7 docks itself whenever it needs to recharge its batteries. Apart from being impressive, this is a very convenient function that you will very likely come to love. It’s also worth noting that, despite having a larger battery, the i7 has the same charging time as the 980 and the 960. To keep the dirt and debris, the i7 vacuum features a washable collection bin. Despite being smaller than that of the 980 or the 960, this collection bin does its job pretty well. As a matter of fact, it’s large enough to allow two and even three cycles before it needs to be cleaned. To dispose of the debris, the Roomba i7 uses the iRobot Clean Base Automatic Dirt Disposal system. This system allows it to empty its own dustbin before it becomes completely full. Without a doubt, this feature can make your life a lot easier (and a lot cleaner). At this point, it should also be mentioned that the i7 robotic vacuum uses high-efficiency filters to prevent dust and debris from entering its system. 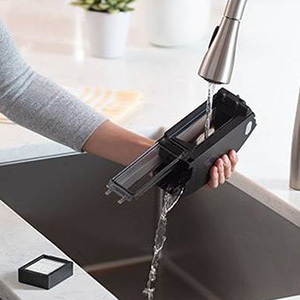 The device comes with three iRobot replacement filters. However, more can be bought whenever it’s necessary to do so. To provide you control over itself, the i7 features three main types of controls. Direct/setup controls: Using three main buttons, the Roomba i7 allows itself to be set up and controlled. These include a “clean” button that you can press whenever you want the device to do its job. Voice controls: The i7 can also be controlled using voice commands. Remarkably, it even allows you to give it a particular name. 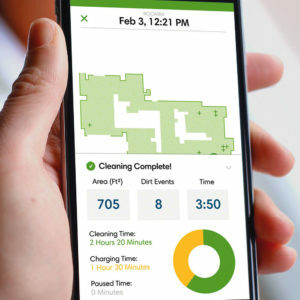 Mobile app controls: Without a doubt, the most effective way to control your Roomba i7 is through the mobile app. This simple and intuitive piece of software allows you to introduce a series of inputs that will regulate the behavior of the robotic vacuum. Apart from allowing you to control this robotic vacuum model, the iRobot app offers other advantages, including push notifications that let you know when the device has finished a vacuuming session or whether it needs maintenance. Additionally, the app provides full cleaning reports. As if all that wasn’t enough, it can be integrated to third parties such as Amazon, Google, Wink, SmartThings and IFTTT. To navigate through your home, this robotic vacuum uses the iAdapt 3.0. This smart navigation system is more advanced than that of the Roomba 980 or the Roomba 960. This advanced system creates precise maps of your home that take obstacles into account. Using it, the robotic vacuum can clean any space more efficiently. In fact, it can even resume cleaning exactly where it left off. Instantly and precisely maps any space. Features various types of notifications and alerts. Great for getting rid of animal hair. Due to its size, takes longer to clean than the Roomba 980 or 960. Final Thoughts: Who Should Get the Roomba i7? Without a doubt, the i7 is a notable robotic vacuum. Effective, efficient and convenient, you will almost forget it’s there while it keeps your home perfectly clean. All in all, the i7 is a product that is great for people with busy schedules, who live in complex spaces and can afford the 1000-plus dollars that the product costs. Even better, the i7 + comes with a Clean Base. 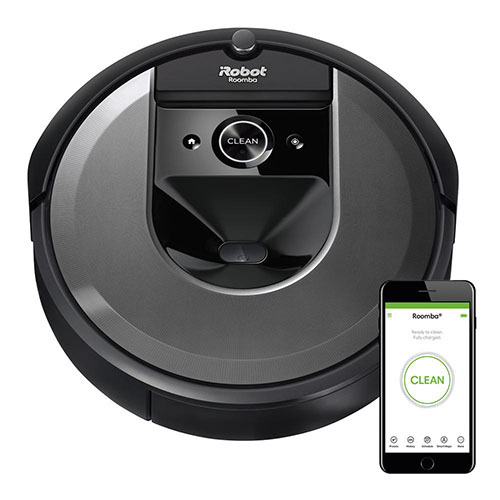 The 980 model is an efficient robotic cleaning device that is highly popular among iRobot customers. 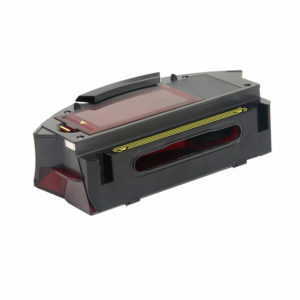 Larger and heavier than the i7, it has strong suction and various smart capabilities. Much like the two other products features in this guide, the 980 has a streamlined design that features basic direct control buttons. These buttons can quickly and easily prompt it to perform basic tasks such as setting itself up, starting or stopping. Like the i7 and the 960, the 980 works well on various different surface types. This includes hard floors such as wood and carpets of different qualities. In terms of performance, the 980 does about as well as its two featured counterparts. 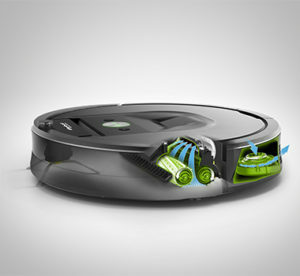 Like the i7, the Roomba 980 can be controlled through a smartphone using the iRobot app. However, it does not have all the features that the newer model has. For example, the 980’s app does not allow you to choose a specific room or environment to be cleaned. To be sure, this robotic vacuum model performs incredibly well. Apart from offering great suction power, its three-step cleaning system is efficient and effective. As a matter of fact, this robotic vacuum features 10 times the air power of older Roomba models such as those included in the 600 series. What’s more, it features a Power Boost option that will help you get rid of heavy debris. To prevent clogging and tangling, this sleek and efficient device uses a multi-surface brush mechanism as part of its three-step system. Same as the i7, this mechanism is great for dealing with animal hair. As a result, the Roomba 980 is a great option for people who have pets. When the 980 senses that its battery is running low, it automatically connects itself to its dock in order to recharge it. Undoubtedly, this is a very convenient feature, and one that is shared with the i7 and the 960. When fully charged, this device is capable of running for up to 120 minutes. Same as it happens with the i7, however, that runtime can be lower depending on the type of surface that the vacuum is working on. Like the other two robotic vacuum models features in this list, the Roomba 980 uses a lithium-ion battery. Durable, resistant and quick to recharge, this battery is better than the nickel-metal hydride (NiMH) that was used on previous models of the Roomba. Now, you should take into account that this battery is smaller than that of the i7 and, as a result, it is less efficient. This robotic vacuum model has a debris disposal system that is very similar to that of the Roomba i7. However, it needs to be pointed out that the 980 has a larger collection bin, reducing the frequency with which you will need to change it. If you remember correctly, however, the i7 has an automatic dirt disposal system that eliminates the need to manually empty the bin. Sadly, the 980 does not have that same feature. Something else worth pointing out about this product by iRobot is its advanced filters. These HEPA-quality filters can remove dust and debris from the air in your home, making the cleaning more effective while eliminating potentially-harmful allergens. As you can probably imagine, this is a fantastic feature for people that suffer from allergies. At the same time, it’s great for people that live with pets. Like the i7, the Roomba 980 has three types of controls. The first type of control that it uses is direct. Located on its body, a few buttons can help you relay basic commands onto the device. For example, using these buttons, you can command it to start or stop cleaning, recharge or initiate a setup process. This robotic vacuum can also be controlled through specific voice commands. Being an older model, however, this device is not as effective when it comes to pickup up voice commands as the Roomba i7. Even worse, it does not allow you the possibility of giving it a specific name. The third way to control the Roomba 980 is through the iRobot Home App. In this regard, the device works a lot like the 960. However, as previously mentioned, there are certain app-related features that the i7 has and this one does not. At any rate, however, you can perform a series of convenient actions using the app. Additionally, it provides cleaning reports. Without a doubt, all the best robotic vacuum options on the market excel at navigation. Even though it does not feature the i7’s Instant Smart Mapping, the 980 is very effective at navigating through a particular space. As a matter of fact, it’s iAdapt 2.0 technology can help it avoid obstacles in a very practical manner. 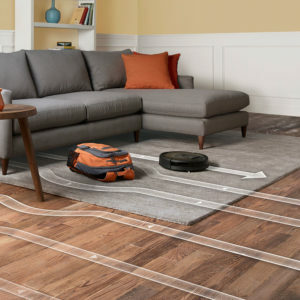 After mapping out a surface with precision and exactitude, the Roomba 980 moves in straight lines with the objective of covering the entirety of the cleanable area. 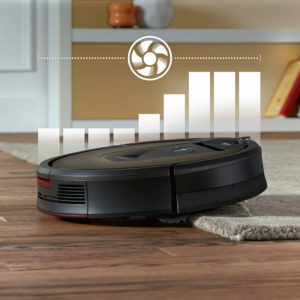 Remarkably, the robotic vacuum has the ability to adapt itself to different floor types as it creates a working plan, thus maximizing efficiency and conserving battery power. Features drop sensors and bump sensors. Can be controlled through voice and app. Does not empty the collection bin automatically. Does not feature Instant Smart Mapping. Final Thoughts: Who Should Get the Roomba 980? Despite being a somewhat older model, the Roomba 980 still holds up very well. Compared to other models, it’s very powerful. Even better, its use of a three-step system that features multi-surface brushes makes it a very effective robotic vacuum. As a result, it’s a great option for people who live in carpeted environments. What’s more, it’s a good option for people that have kids and/or pets. Very quickly, you will realize that the Roomba 960 is a lot like the 980. As a matter of fact, their controls are basically identical. Even more so, they have the same size, weight and basic design. However, there are some important differences between the two that we will cover in this article. Without a doubt, the i7 and the 980 have certain features that make them more complete robotic vacuums than the 960. However, 960 also has important characteristics that make it a very good option. That is particularly true when considering the fact that, out of the three Roomba models featured in this article, the 960 is the most affordable. To clean your floors, the 960 uses a three-stage system that is very similar to the one used by the 980. However, the 960 does not use a multi-surface brush mechanism like the 960 and the i7 do. At any rate, though, the 960 is very effective when working on hard floors of any type. Granted, this effectivity may be reduced when working on carpets, particularly high-pile ones. To capture dust and debris from the air, this robotic vacuum uses a high-efficiency filter. This filter has been proven to be capable of capturing up to 99 percent of all allergens in the environment, including dust and pollen. As a result, this robotic vacuum is a fantastic option for people who love pets like dogs or cats. Like the i7 and the 980, the Roomba 960 automatically docks itself to charge its batteries whenever they become dangerously low. Like that of the 980 model, this battery is a 2600mAh lithium-ion. Unfortunately, this battery produces a runtime of only 75 minutes. Even though this is nothing to scoff at, this runtime pales in comparison to the whopping 120 minutes that the Roomba i7’s battery is capable of producing. In terms of debris disposal features, the Roomba 960 does not have anything to show that we haven’t already discussed regarding the 980 or the i7. It should be noted, however, that it’s collector bin’s capacity is smaller than that of the i7. While the latter is capable of taking up to 0.7L, the 960’s bin is only capable of capturing 0.5L at a time. Basically, the Roomba 960 has the same controls that the 980 and the i7 have. In other words, it can be controlled through basic body buttons, voice commands and through the iRobot Home App. More or less, everything that has been said about the 980 in this regard is true about the 960. At this point, it would be helpful to note that the 960 was one of the first Roomba models that allow users to control it remotely using the smartphone app. Uses a dual-mode virtual wall for containment. Can be controlled remotely using the smartphone app. Features a side-brush for additional cleaning efficiency. Works well on low-pile carpets. Does not work well on high-pile carpets. Final Thoughts: Who Should Get the Roomba 960? As you probably realized by now, this iRobot iteration does not have any clear advantages over the 980 or the i7. However, considering that it’s an older Roomba model, it can be confidently said that the 960 is an impressive piece of technology. At the same time, it’s more affordable than either of the other products featured in this guide. First, let’s go over the Roomba i7 vs 980 pairing. Navigation: Because it uses a more advanced navigation system, the i7 has a clear advantage over the 980 in this area. Additionally, the i7 uses Instant Smart Mapping. This system allows it to create a complex map of your home. Consequently, you can command it to clean specific sections of your home. Sadly, this features is not available for the 980 model. Debris collection: Unlike the 980, the i7 model features an automatic emptying of the collection bin. As you may imagine, this is a rather convenient feature. Additionally, the i7’s collection bin is washable while the 980s is not. 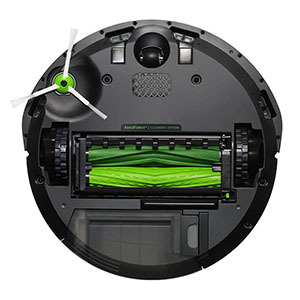 Now, let’s go over the Roomba i7 vs 960 pairing. Suction: Unfortunately, it needs to be said that the 960 model offers less suction power than the i7 model. This may become apparent when attempting to clean high-pile carpets and other similarly-difficult surfaces. Size and Weight: Two of the most obvious differences between these two models are in their size and weight. The i7 is both smaller and lighter than its counterpart. Finally, let’s go over the differences between the 980 and the 960. Battery: Despite having the same type of battery as the Roomba 960, the Roomba 980 has a longer runtime than its counterpart (120 minutes versus 75 minutes). Power: Without a doubt, the greatest difference between these two Roomba models is in their power. The 960 has a 5x AeroForce 3-Stage Cleaning System. Meanwhile, the 980 has twice the power as it uses a 10x AeroForce 3-Stage Cleaning System. Having gone through everything that these three Roomba models have to offer, it’s easy to see why they enjoy such popularity. Efficient, effective and remarkably intelligent, they are all capable of making your life a lot easier. 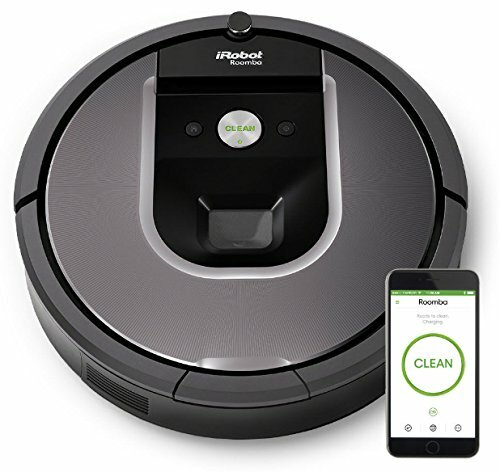 Having done the research and thoroughly compared the three models, however, it is possible to lean slightly towards the Roomba i7. Being a newer model, it has certain features and characteristics that its counterparts simply do not. What’s more, the robotic vacuum’s advanced mapping and navigation system can greatly improve its efficiency, particularly when it comes to reduced or difficult areas.